2019 is just around the corner—along with its focus on resolutions—and it pulls me into a period of introspection. Actually, it’s a good thing. It gives me a chance to look back over the past year and decide what worked and what didn’t. It also gives me a push toward trying something different. 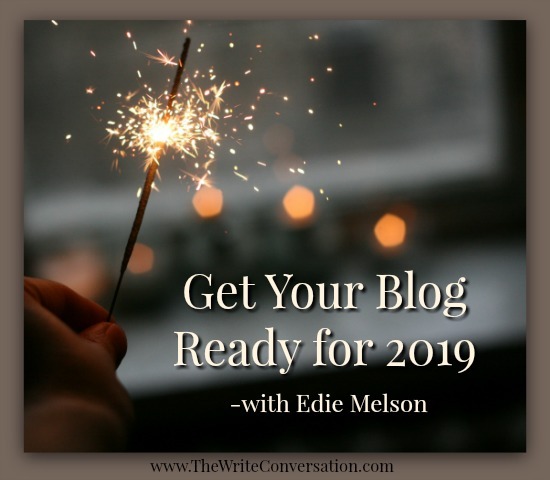 Today I’d like to invite you to join me in one aspect of this journey and get your blog ready for a great 2019. Click on your own site and look at it with these thoughts in mind. Here’s the checklist I use to evaluate my sites. Don’t hesitate to tweak it to fit your needs. Make sure your site hasn’t become too cluttered in the sidebar area. Clean out any old links and add any you’ve been considering. Take a look at the position of your sidebar gadgets. Many times during the year I’ll add something and it will push other things down. It’s important that you have your email and RSS signups at the top where people can get regular updates when you post. Also be sure to check all your links, especially for social media. Nothing’s more frustrating than a visitor trying to connect with you further and come up with a dead end. Recheck your default font. Sometimes you’ll find you’ve drifted into a different one. Whatever font you use, make certain it’s easily readable…on all screens. Update your about me section on your site. Include the things that have happened over the past year in regard to publication, job changes, awards, and anything else applicable. If you have a calendar with your speaking engagements, update it as well. Also be sure to update any lists you have of other sites, like those for writers, photographers or others. Now take out your mobile device (cell phone, tablet, e-reader, whatever) and make certain your site looks good on a smaller screen. This is vital because at least two-thirds of all visitors to your site will be looking at it from a mobile device and that number will continue to increase! Reassess what action you want your reader to take after viewing your blog. Maybe you want them to share your site with their friends/readers. Perhaps you’re selling a book. Even if it’s only to follow you on Twitter, make sure it’s easy for them to see what you want and then execute it! This is also a good time to look at your blog posting schedule and evaluate the popularity and efficiency of your different topics. You can do this by utilizing the stats section of your blogger dashboard or of your specific blogging platform. First, look at the most popular posts of the past year. Do they fall into a specific category or theme? If this isn’t the main focus of your blog consider making it a bigger part of your posting schedule. Next look at the day of the week when you get your most hits. Does it correspond to your posting date or is it the following day? You may need to tweak when your email notification is sent out. Finally, Google the subject of those popular posts. Don’t plug in the exact title of those blogs, instead try a more generic subject search. The purpose of this is to see where within that search your blog entry is falling. We all benefit from a yearly checkup and our blog is no different. I’d love to hear how you use this time to get ready for the New Year ahead! Thanks for the tips, Edie. Happy New Year to you and The Write Conversation. Great tips! Thank you so much! Happy New Year!! Thank you for these guidelines. I will look at my blog with a different eye. Wow. Great ideas...here's hoping I can implement at least some of them. :) Obviously, I need to get to your marketing conference soon. Thanks Edie! Since I want to revitalize my blog in 2019, I’ll be sure to keep your checklist beside me. Thanks for always being a step ahead. Thanks, Edie, for such a helpful post. I will implement it this year.